The European Meteorological Society has chosen Julia Slingo as Laureate of the EMS Silver Medal 2017. She is honoured for her outstanding contributions to meteorology and climate predictions. She has led the work that brought new understanding of monsoons and intraseasonal variability associated with the Madden-Julian Oscillation. As a strong advocate of seamless weather and climate prediction she was at the forefront of its development and implementation. Through her inspirational leadership she facilitated joining together strong relationships, frameworks and networks. She championed the importance of communicating the dangers of climate change to decision makers and the public. The Silver Medal ceremony, which includes a Silver Medal Lecture by the Laureate, will be held on Tuesday, 5 September 2017, during the Annual Meeting of the EMS in Dublin, Ireland. Professor Dame Julia Slingo has made an outstanding contribution to meteorology on an international scale. Throughout her career Professor Slingo has brought innovative approaches to understanding and modelling weather and climate; these have led to new insights into how the atmosphere and climate system works and to significant advances in predictive skill. 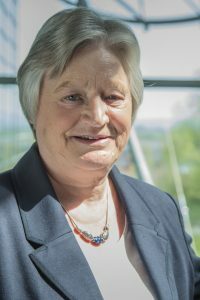 Her appointment as Met Office Chief Scientist in 2009 recognised that contribution and the science leadership she has provided to the UK and international research community. Professor Slingo retired in December 2016 after a long and distinguished career. In her early career Professor Slingo contributed to significantly improving our understanding of clouds and how they interact dynamically with the atmosphere, carrying out work at the Met Office, European Centre for Medium-range Weather Forecasts (ECMWF) and the National Center for Atmospheric Research (NCAR). Returning from NCAR she joined the Department of Meteorology at the University of Reading where she founded the group on tropical climate. This group is still undertaking ground-breaking work in tropical convection, monsoons, climate variability and in seasonal and decadal prediction. Her own interests led to a very distinguished research interest in the Asian monsoons. She is one of those rare scientists who has been able to contribute to both our core understanding and to advance our capabilities in mitigating adverse impacts of the monsoon. Professor Slingo was the first female Professor of Meteorology in the UK and led the UK’s climate science community as Director of Climate Research in NERC’s National Centre for Atmospheric Science where she pioneered high resolution climate modelling. In 2006 Professor Slingo was the founding Director of the Walker Institute, which today has an international reputation for its interdisciplinary work on addressing the challenges of a changing climate. More latterly, as the Met Office Chief Scientist, she has strengthened the scientific and technical programme within the Met Office, driving forward the integration of weather and climate science, and building strong partnerships between the Met Office and the wider research community. Julia Slingo has championed the importance of communicating developments in atmospheric and climate science with a wide audience. She led the development of the Met Office’s Research News web pages, which provide insights into atmospheric science for educated non-expert readers. In 2015, Professor Slingo was appointed as one of the seven members the High Level Group of the new European Commission Scientific Advice Mechanism group. Professor Slingo received the Royal Meteorological Society’s Buchan prize in 1998 and in 2016 was awarded the IMO Prize of the World Meteorological Organisation. She was awarded the OBE in 2008; in that year she became the first female President of the Royal Meteorological Society. In 2014 she was awarded her Damehood for services to weather and climate science and was named as one of the top 100 scientists in the UK by the UK Science Council. In 2015 she was elected a Fellow of the Royal Society and in 2016 became a Foreign Member of the US National Academy for Engineering. Since her retirement Prof. Slingo has continued to be active in weather and climate science, serving on a number of committees and acting as Special Advisor on Climate to the Secretary General of the World Meteorological Organization. In 1972 Julia Slingo graduated from Bristol University with a B.Sc. in Physics, and in 1989 with a Ph.D. in Atmospheric Physics. From 1973 to 1980 she worked at the Met Office as Scientific Officer and later as Senior Scientific Officer. 1988 – 1990 and 1986 – 1987: Visiting Scientist, National Center for Atmospheric Research, Boulder, Colorado, U.S.A.
1990 – 2002: Research Fellow in UK Universities’ Global Atmospheric Modelling Programme, based at the NERC Centre for Global Atmospheric Modelling, University of Reading with title of Professor of Meteorology in October 2000. Personal entry in ‘Who’s Who’, 2005 onwards. EMS Silver Medal. The EMS Silver Medal was established in 2008 to honour important contributions to the development of meteorology in Europe. The Award is presented annually. Candidates for the EMS Silver Medal are nominated by Member Societies and Associate Members of the EMS. The EMS Awards Committee, consisting of senior members of meteorological institutions in Europe, makes recommendations to the EMS Council for a final decision. Previous recipients were the late Karin Labitzke (Germany), René Morin (France), Lennart Bengtsson (Sweden/Germany), David Burridge (United Kingdom), the late Jean-François Geleyn (France/Czech Republic), Tim Palmer (United Kingdom), Hartmut Graßl (Germany), Peter Lynch (Ireland), Anton Eliassen (Norway) and Michel Jarraud (France/Switzerland). 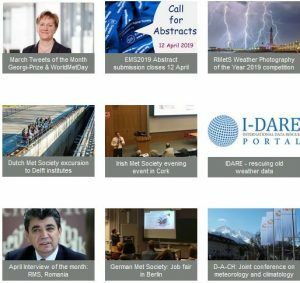 EMS Annual Meeting: European Conference for Applied Meteorology and Climatology. The theme of the conference is “Serving Society with better Weather and Climate Information”. More information on the EMS Annual Meeting, 4-8 September 2017, in Dublin, Ireland, is available at http://www.ems2017.eu/for_the_media.html. Registration for the Media will be available online from May onwards. The Met Office. The Met Office is the UK national weather and climate service. Its main mission is to ensure the safety and protection of the population and the infrastructure. It has the responsibility of observing weather and climate over the country and forecasting the evolution of the atmosphere, of the snow and the surface oceanic characteristics. It hosts the Met Office Hadley Centre, a world-leader in climate prediction and climate change science.